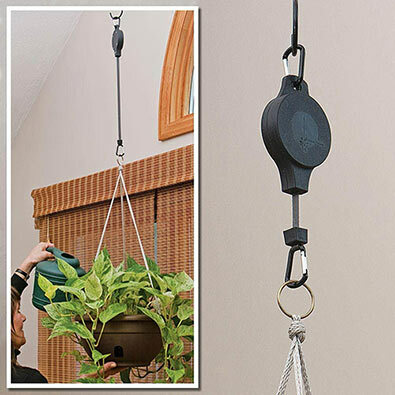 The Plant Pulley is the ultimate pulley system for your home plants. It lets you raise and lower plants with just a gentle touch. Easy down, easy up. Ratcheting pulley locks at any level and retracts when you're finished. Keep plants healthy and vibrant without the mess. Great for bird feeders too. Pulley measures 13cm x 8cm. Made of sturdy plastic. Retractable nylon strap extends 102cm. Set of two.